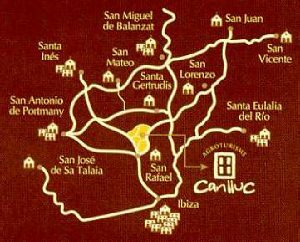 In the heart of rural Ibiza, in a wonderful, quiet valley surrounded by beautiful, ancient pine, almond and olive trees, you will find Can Lluc, an idyllic place which preserves the spirit of the Mediterranean Ibiza. 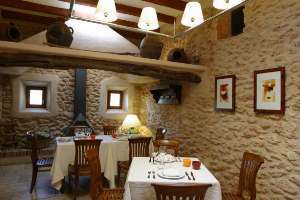 In Can Lluc you can enjoy a traditional house, in rooms with full facilities and comfort. The spacious, cosy communal areas, gardens, swimming pool and solarium will ensure a pleasant and unforgettable stay on the estate. Twin bedded room, fireplace, bathroom with hydro-massage shower. Terrace. Intercommunicating with room 3. 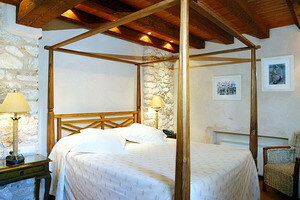 Superior double room with lounge with a sofa-bed, fireplace, bathroom with bath. Terrace. 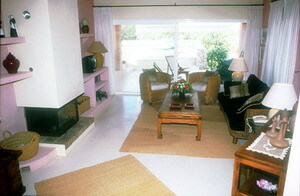 Double room with fireplace, bathroom with bath. Terrace. 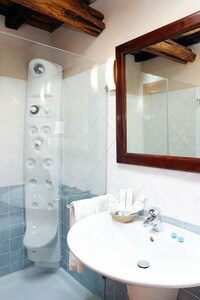 Double room, bathroom with hydro-massage shower. Terrace (first floor room). Superior double room, bathroom with Jacuzzi. Terrace. 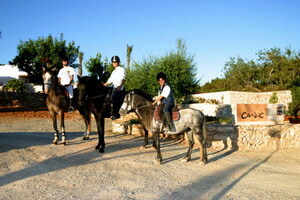 Can Lluc’s farm tourism centre is located in the middle of rural Ibiza, in a beautiful, quiet valley. Around Can Lluc’s farm there are many wonderful places to explore and enjoy their natural beauty. The possibilities offered are very varied, and will appeal to all tastes. There are many paths around the farm, which immerse you in a luxuriant forest of pines, and beautiful landscapes. 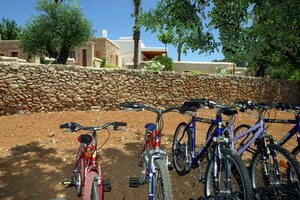 In addition, in Can Lluc you can borrow our free bicycles, which will allow you to explore the surroundings and, if you wish you can also go on a horse riding excursion. Inside the farm grounds there is a swimming pool, and a solarium where you will be able to relax in Ibiza’s wonderful sunshine. In Can Lluc we arrange for you the hire of cars and boats, so that you can go round the island, enjoy its picturesque coastline and dive into the crystal-clear waters of its beaches. Rates per room and night. Breakfast included, VAT excluded. Time of arrival: 16:00 hrs - Time of departure: 11:00 hrs. Delayed exit: Additional position 1 night. To confirm your reservation, we need details of your credit card (number and expiry date). A deposit of 30% of the total stay will be charged, with a minimum of one night (50% for groups). If a client cancels the reservation between 30 and 7 days before the arrival date, the client loses the amount advanced, with a minimum fee of one night. If a client cancels the reservation less than 7 days before arrival or there is no show, the total amount of the stay will be charged. In the event of a customer wanting to leave before the expected date of departure, the total amount of the stay will be charged. The customer must always notify the hotel reception if the arrival time will be after 22 h.
In attention to customers, Can Lluc will deduct the amount of penalization paid from future stays, provided they are booked for low season and always subject to availability.